Fire brigade - Large tank fire brigade vehicle (MAN), 1969. Driver's cab red with black interior. Chassis, wheels and rear fenders black. Fifth wheel plate silver, headlamps hand-painted in silver. Vent slots as well as frame and MAN Diesel lettering painted silver. 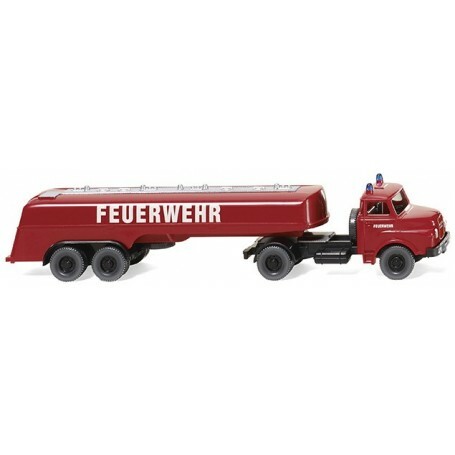 'Feuerwehr' lettering on side of driver's cab. Trailer with red tank and black axle mounting. Double fenders and wheels also black. Lettering 'Feuerwehr' on side in white. Foot step on the tank in aluminium.